We have a new house and garden (in central MD, zone 7). We've tilled long rows (20' x 7') in a place where there has never been a vegetable garden (at least not for six years, most likely much longer). We tilled in composted horse manure that had decomposed with straw. The soil was pretty good to begin with. 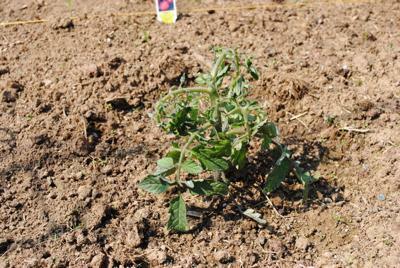 We planted tomato seedlings about a week and a half ago, and they are not doing well. Some are fine, but most are shriveling and stunted. 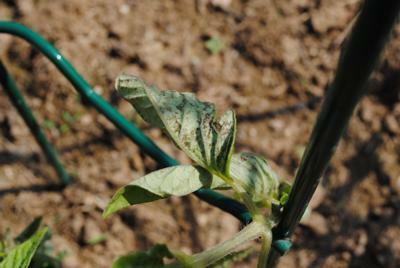 Some have some small brown spots on the underside of the leaves. We've had very hot and humid weather, with quite a lot of rain. I dug around yesterday and it seemed fine, though--not too damp, not clumping. I dug up one seedling that seemed like it was on its way out, and it looked like the stem was rotting next to the roots. Is this a damping off problem? Is it disease? I worried initially that the composted manure might be too strong, but if that were the case it would be too high in nitrogen and the foliage would be thriving, right? All other direct-sown seeds germinated quickly and seem to be thriving. 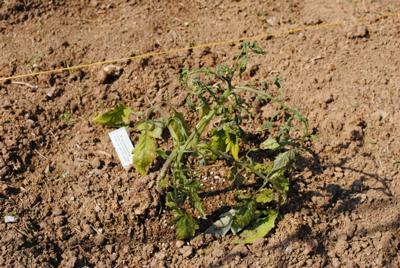 Cucumber seedlings planted right next to these tomatoes are thriving.